My son is doing some gaming with his own group, so he has been spending a lot of time working on his own stuff. So I have been reading a lot of Castles & Crusades. I have to admit, and this is not really an admission since you all know this, but I love this game. For me, it really hits a nice blend of 1st, 3rd and yes even 5th Edition. Plus there is lot of material that I have not even been through yet. The more I read it the more I REALLY want to use this for my War of the Witch Queens adventures. But before I do that I want to look at some of these adventures on their own merits. 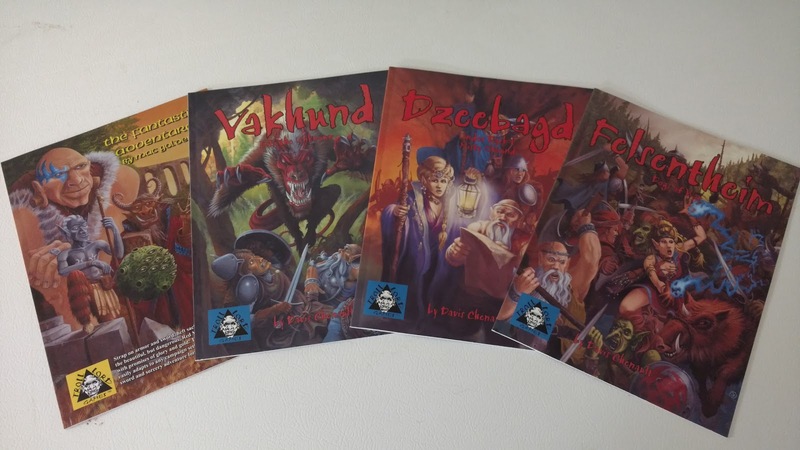 Review Disclaimer: I purchased these adventures as part of a Kickstarter add-on some time ago. This is a short adventure, 16 pages, for 4 to 8 characters of 1st to 3rd level. Actually, it is three very short adventures in a general area. One flows to the next easily and can be run in a couple of sessions. The starting adventure revolves around finding a missing gem and this leads to the PCs saving a deranged golem. There is also a host of really weird and interesting NPCs that could, if needed, be used as characters. I know that C&C typically takes its cues from AD&D1, but this adventure felt like something right out of D&D Basic to me. I mean that in the best way possible; I love D&D Basic. This would make for a good first adventure to anyone new to C&C, but familiar with other FRPGs. I often gush at the nostalgia fuel that Castles & Crusades often is for me, but this adventure really does capture a lot of the fun of playing in the late 70s and early 80s. Particularly the early 80s. It is set in their larger, and somewhat more dangerous, World of Aihrde and can lead up to their other adventures. Or it can stand alone for a couple nights of rolling dice and having fun. 26 pages, for 4-6 characters levels 1 to 2. Vakhund, Into the Unkown is a short adventure that builds up to some epic events in the later I series from Troll Lords for Castles & Crusades. It starts out simple enough really. The party has been hired as guards for a caravan. Soon the wealthy merchant is dead and his daughter kidnapped. Vakhund is interesting since for an adventure that has it's DNA in a game known as "Dungeons & Dragons" there are neither dragons nor dungeons (for the most part) in this adventure. Typically for low level adventures there is a dungeon to explore. In this one the PCs are thrown right to a plot and it is rather interesting to be honest. 34 pages, for 4-8 characters levels 2 to 4. Following up on the events of I1 Vakhund the party finds the missing girl but uncovers a larger plot involving many local factions. The conceit of the adventure is the party will be drawn in, but as far things go this is not a bad one. This one is a bit longer than the last adventure and a bit more involved with all the factions. This adventure can stand alone, but it works best as part of the I trilogy. Interaction with the NPCs is really what makes this adventure so the game master should read up on all of them and their motivations ahead of time. 22 pages, for 4-8 characters levels 3 to 5. Felsentheim is the epic conclusion to the I series of adventures. As with the last adventure the GM should be knowledgeable on all the NPCs and factions in this adventure. Again it can be played on it's own, but works best as the conclusion to the I series. While the adventure is shorter there is quite a lot of combat in this one. All together these three books are greater than their parts and make for an interesting set of adventures. Interestingly enough the entire time I was reading these I kept thinking how well they would work with Astonishing Swordsmen & Sorcerers of Hyperborea. Not that there is anything here that screams AS&SH to me, but just a feeling that it would work well. I'll have to try it someday.